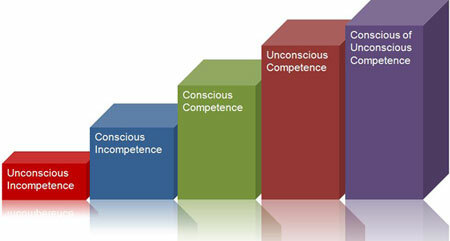 Thoughts about conscious incompetence came to mind in the light of Bonnie Stewart’s recent blog post – The Story of Education: A Grimm Fairytale in which she recounts her loss of her blogging voice and how she feels that her voice has been ‘wrong-footed and is shaky’. I don’t want to oversimplify her post. You will need to read and interpret it for yourself, but I did wonder whether her recent entry into the academic world of a PhD student – “I did not fully understand the extent to which my own voice and formal Academic Writing did not/would not mix” had pushed her into the conscious incompetence zone. (This of course raises all sorts of questions about academic writing, but I don’t want to go there just now). I have heard others speak about losing their blogging voice and wonder if they too have been pushed into the zone of conscious incompetence in some way. I feel as though I live in a permanent state of conscious incompetence and I wonder how much this is to do with working so much online, having Twitter, Facebook, LinkedIn and Flickr and other accounts, following people’s blogs, participating in MOOCs etc. It seems that I am constantly reminded of what I don’t know and how little I know, in the face of so much information about what other people do seem to know. The internet is a great leveler. I have worked for most of my life in education, but only online for the last 14 years or so. Before that I worked either in schools, or with students in Higher Education, and was, for the most part, blissfully unaware of expertise beyond my limited circles. When teaching school children, although I could easily recognize those children who were brighter than me and would definitely go further, I had the advantage of age and life experience. Even with students in Higher Education I had this advantage. But in recent years my work has been ‘out there’ in the big wide world and it is difficult not to be conscious of your incompetence. At the ALT2013 conference which I recently attended, I briefly discussed this with Stephen Downes, who was a keynote speaker for the conference. His response (one to remember) was that there will always be people ‘out there’ who know things that you don’t, no matter what your reputation and level of expertise, but it’s worth holding on to the fact that you will always know something that they don’t. So maybe this is what is meant by the internet being a great leveler and maybe conscious incompetence in these terms isn’t so bad! One of the pleasures of ALT-C 2013 for me was that I discovered/met two readers of this blog who I was not aware of. These contacts were very meaningful for me and from them I was reminded of two reasons why blogging works for me. 1. Blogging for me is about personal reflection. One of these two readers told me that for him his blogging days had dried up two years ago. I can easily relate to that because I go through phases when I feel that I have nothing to say/write about, which always brings to mind a comment that I once heard Stephen Downes make (or it might have been write) – that if you have nothing to write about then you can’t be a very interesting person. I remember feeling completely demoralized by this – but on reflection I don’t think it’s true. Writing/blogging is not for everyone. There are many ways of expressing oneself and reflecting on practice, and many of these ways will not be in the public eye. I’m not sure why I persevere with blogging, but at ALT-C I did say to the person who was kind enough to comment that he enjoyed reading my blog, that I use my blog as a place for recording my thinking and reflection. I often feel uncomfortable about it, but for now the benefits seem to outweigh the tensions I feel between privacy and exposure. And when I’m really on a roll, for me Jackson Pollock’s sentence – “When I am in my painting, I’m not aware of what I’m doing” could equally apply to blogging. 2. Blogging props up my appalling memory. The other person I met who reads my blog, reminded me of a post which I myself didn’t remember. I have long been aware that I have a very poor memory and blogging is a way of making sure my thinking is recorded – a sort of memory bank. I think Lisa Lane once described blogging as a tool for compensating a failing memory – or words to that effect. I rarely read back through my blog, but I am sometimes surprised in the stats by the posts that people are reading and so go back to remind myself about what I was thinking at the time. I have recently realized that perhaps I should make more effort to organise my blog in such a way that it would be easier to remember what I have written. This was sparked off by Matthias Melcher’s new blog – where he has a wonderfully organized Contents page. Since Matthias recently moved his blog to this WordPress site and set up this contents page, we have been discussing how tagging might be able to help me and others find and remember what I have on my blog. I have been aware for some time that my tags are a mess, which is why I don’t have a tag cloud in the side-bar, but I have not yet sorted out a way forward out of this mess. In the meantime, it has been great to make two new connections through this blog.